"Want a cool Hello Kitty Birthday Party?" So your little girl wants a Hello Kitty Birthday Party. She loves cats and kittens. Then a cat theme birthday party will be a prefect theme for your kids next birthday. 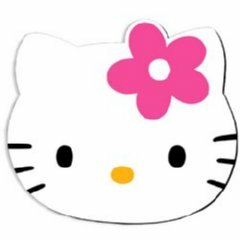 Look at our cool and fun Hello Kitty party ideas below to get lots of Free ideas for your daughters Hello Kitty birthday party. I hope our Hello Kitty birthday party ideas will help you plan an awesome party. Please don't forget to Party It Forward. We would love to receive pictures of the party or other ideas which were a great hit. This will improve this site, but also help other parents like you to get more Free Hello Kitty birthday party ideas. A cat theme party invitation can be in the shape of a kitty head, paw print, a mouse or a fish. Anything related to Hello Kitty. If you have little time, the best thing is to purchase Hello Kitty birthday invitations. But if you have lots of time or are in a budget- make them yourself. Take a picture of your daughter with her favourite stuffed kitten (or a real cat, if she has one? ), with your digital camera. Using your computer print the picture out on pink cardstock paper. Fold the paper in two and you have a Kitty Birthday Invitation. Inside the invitation write the party information. Mail the party invitations with white glitter or confetti inside the pink envelopes. You will need A4 coloured card, scraps of card in white, pink, green, black, blue and orange, hole punch, zig-zag scissors, glue, and pink green cord. Pile together the pink and the blue sheets on top and punch two holes on the left side. The blue sheet should be on top of the pink sheet. Cut a stripe from each colourful card using your zig-zag scissors. Now you should have 4 stripes in different colours, glue them on top of the green sheet, making a border. Draw and cut out a cat face from the orange card. Glue it on the middle of the blue sheet, overlapping the borders. Now cut out the features of the cat from the card (white eyes, black whiskers, etc) or draw them on the cats face. Lastly, thread a pink cord through the holes. Tie in a bow at front. Write the party information inside. Please join us for a Perr-fect Hello Kitty Party! Our Princess is turning 4! Honour her with you presence! You can buy a Hello Kitty costume for your little princess or if you're in a budget just give her a mini make over. Give your child a headband with cat ears and paint some whiskers and a noise on her face. Voila, she will look like a cute little Kitty. If you have not asked guests to dress up as Kittens, then provide them with headbands with cat ears to wear as they arrive at the party and give them a mini make over. Keep your Hello Kitty birthday party decorations in light colours. The main colours are pink, purple and silver. Hang lots of pink, purple and silver balloons all over the party area. Decorate the party area with cat pictures, cat toys, and cat party goods. Use pastel coloured papers streamers to decorate the party room. Hang a "Happy Birthday" banner with your daughters name on, in the middle of the party room. Hang a bunch of helium balloons outside your house, so the kids know were the party is. Use a Hello Kitty birthday party table cloth. Use matching table ware with Hello Kitty on the plates, cups, etc. Have a kitty helium balloons bouquet for centrepiece. Place the balloons in the middle of the table and let the ribbons run in different directions. If the balloons can't stay in place, put a little tape to hold them in place. Set up a Hello Kitty pet place. Use a pop-up tent to create the Kitty pet place. Put lots of pillows inside the tent and lots of different stuffed kittens, small balls, etc. Make index cards for each kitty stating each kitty's name, fur colour, birth date, personality, such as likes to sleep, very shy, good with children, etc. The small kitty's will be adopted by the guests at the party. As guests arrive to the party take them to a mini make-over table, were they will receive a cat make over. Paint a cat face using face paint - paint a nose, whiskers, etc on each girl. Before the Hello Kitty birthday party make Kitty tails (out of felt) for the kids. Attach the tails to their clothing with safety pins. When done, give each kid their own cat ears- headband with felt ears attached or let the kids make their own ears later at the party. The kids will look like little kitty's, so cute. 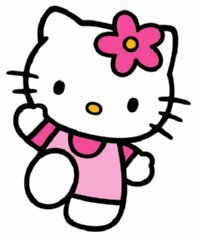 While the kids wait to be face painted, invite them to colour some Hello Kitty birthday party clip art. Print the clipart out from the internet beforehand. Provide the kids with crayons, glitter, etc. When guests are done with their cat make over, take them to the kitty pet place. The fun starts by each guest adopting a stuffed cat. All the activities and crafts of the party will be planed around this cat. It's lots of fun and the girls will love it. Either order your kitty craft kit or, collect the supplies yourself. The collars are made out of stretchy thread and beads (normal beads and letter beads from craft stores). Tell the kids to put the letters of their cats name on the collar. Let the girls make kitten ears. You will need felt, faux fur, sequins, etc (available at party stores). Have the children decorate their kitten ears. Order cathouses or make your own, buy plain gabled boxes, cut a opening in one side of the box- a door. Give the kids crayons, markers, etc, and let them decorate their cathouses. We have lots of fun games for your kids Hello Kitty birthday party, have a look below. Beforehand hide small stuffed mice throughout the party room. The kids and their kittens then have to look for the mice. The child who finds most mice, wins the game. Have a little present ready for the winner. Similar to Duck, Duck, Goose. Let the children sit in a circle. The "Mouse", who is it, walks around the outside of the circle of the seated children. Tapping each on their head and saying "Mouse" to all except to one, who is "Cat". The Cat then gets up and chaises the mouse. When the mouse is caught she sits down and becomes a cat, and the cat becomes a mouse. And the game starts again. Have a Hello Kitty theme show competition. The girls and their Hello Kitties are going to compete in different categories. Which cat is the funniest, fastest, loudest meow, etc. Give out ribbons like in real cat shows. Let the girls play around with their cats, cats-houses, and each others cats. It's lots of fun especially for younger children. Let the kids make a big circle. One person stands in the middle with her eye closed. The other kids have to change place. Then tell one kid to meow like a cat. The person in the middle then has to guess who is making the cat sound. If she guesses right the person who meowed has to stand in the middle and the other person now stands in the circle, and the game starts again. Play the game until everyone has guessed at least once. The kids have to walk across a piece of bubble wrap, on all fours like a cat. They have to do this without popping any bubbles. Have the kids sit in a circle. The first person whispers a cat sentence to the person sitting next to her, like - "My cat loves fish", and then that persons whispers what she heard to the next person. When the sentence gets back to the person who made it up, it's very different. Compare the two sentence which each other, did it change dramatically? Let each kid come up with a cat sentence at least once. Similar to Hot Potato. Let the kids sit in a circle. Have music playing in the background. Have the kids pass the yarn around the circle. Stop the music, the kid who is holding the yarn at that moment is out of the game. Play until there is only one person left. Lots of fun, have the kids and their cats do cat commands. Very cute to watch. Similar to Pin the Tail on the Donkey. Draw and cut small bow shapes out of construction paper, one shape for each kid. Let the kids pin the bow on the Hello Kitten poster. The kid who puts the bow closest to the correct place, wins the game. Don't forget to blindfold the kids and spin them around 2-3 times before they try to pin their bows on Hello Kitty. Finish the party of with a Hello Kitty pinata, it's lots of fun and the kids love pinatas. Fill the Hello Kitty pinata with small cat related items and lots of candy. Pick some of our yummy Hello Kitty birthday party food ideas below. Tea Sandwiches: First toast sliced bread, then using a fish shaped cookie cutter cut out fish shapes. Then fill the sandwiches with tuna and mayonnaise. Filled Croissants: Spread various fillings inside the croissants, such as cream cheese and strawberry jam, smoked salmon and cream cheese, etc. Pink Popcorn: Looks really nice and goes with the theme. Make popcorn as you normally do when done mix it with melted pink margarine (mixed with pink food colouring). Mix well. Voila you have pink popcorn. Hello Kitty Cupcakes: Either purchase cupcakes or bake and frost some yourself. Using white icing, frost a big white circle around the cupcakes. Use small candies as eyes and mouth, shoestring liquorice as whiskers, and cookies as ears. Strawberries Cream: Mix well strawberries with whipped cream in a mixer. Mix until the cream looks like thick whipped cream. Add some sugar. Now you have a wonderful dessert. Strawberry Shake: Mix strawberries, banana, sugar and milk together in a mixer. You can add a bit of vanilla ice cream if you want to make it a bit thicker. Pink Punch: For this Hello Kitty birthday party drink, you will need, ginger ale, pineapple juice, and fruit punch. Mix well. Pink Soda: Serve soda with pink heart shaped ices (get this ice at party stores). Pink Milk: If the kids are smaller serve them strawberry milk. To make this Hello Kitty birthday party cake you must first bake two round cakes. When done, let the cakes cool completely. Cut two triangles for ears and two circles for jowl out of one of the cakes. Put the cake on a large tray. Assemble the cake- round face, two ears on top, two jowl on top of the round cake. Frost the whole cake with white frosting or pink frosting. To make the icing look as fur- press a butter knife into the icing and pull it straight up quickly. Do this procedure all over the cake. Using black gel frosting make whiskers and ears. Using black jelly bean for eyes and yellow jelly beans for noise, mouth and eyeballs. Fill the party bags with small Hello Kitty related items such as cat stickers, cat erasers, cat notepads, cat colouring books, small cat change purses, etc. Also, don't forget to give the kids their adopted Hello Kitty, their cathouse, and their cat ears to bring home as favor. To make the actual goody bags, buy small pink lunch bags and put Hello Kitty stickers on them. Also, put some white glitter - using glitter pens. When all the kids are done with their face painting and Hello Kitty adoption take a group picture of all the kids with their cats. Use this picture as a tank you note, write something nice at the back like "Thank You for Coming to my Hello Kitty Birthday Party".